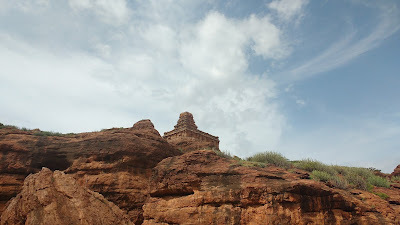 Badami is a small taluka place tucked in the rocky folds of North-Central Karnataka. 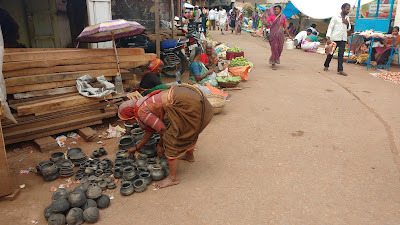 The town spreads evenly around the central North-South main road which also serves as the main market. Parallel to this road on the Eastern side rise two hills - Vatapi and Ilvala - that flank a small lake called Agastyateertha. 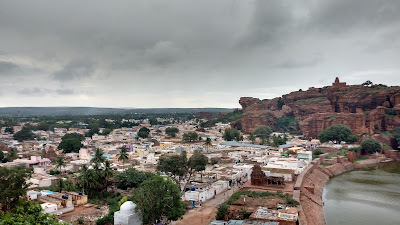 The name Badami is a misnomer of Vatapi, the name by which the town was originally known. The Vatapi hill - the northern of the two - is a compound structure with high plateaus separated by deep gorges giving commanding views of the town below. 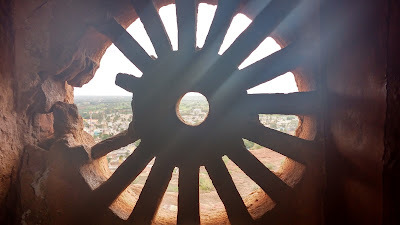 As such these natural defenses were first employed by the Chalukyas in the 6th-8th centuries when they used it as their capital. 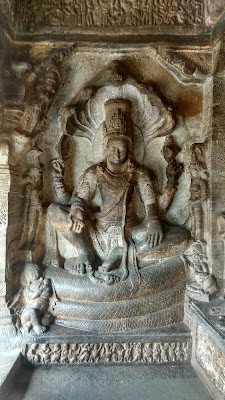 The cultural ingenuity and the experimentation in temple architecture from that era has left an indelible mark on this small town, attracting quite a few visitors to its fold. 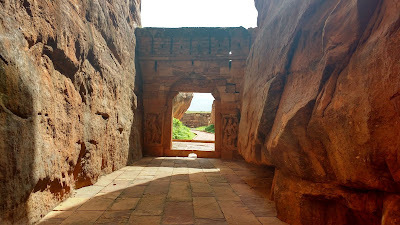 The more famous wonders of Badami - the rock-cut cave temples - are located on the southern Ilvala hill. 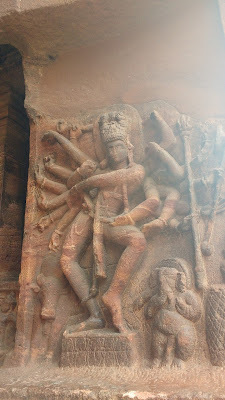 These temples feature most elaborate sculptures related to Shaiva, Vaishnava and Jain sects. 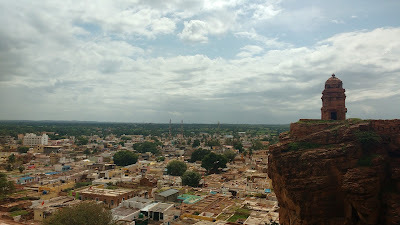 There are a total of four caves numbered from the base of the hill to upwards. 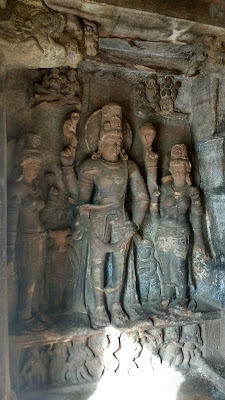 All the caves are carved in the northern facing wall of the hill. 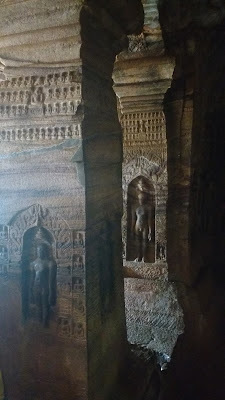 The caves are accessed by a staircase made in a broad channel between the hill and a rocky spur. 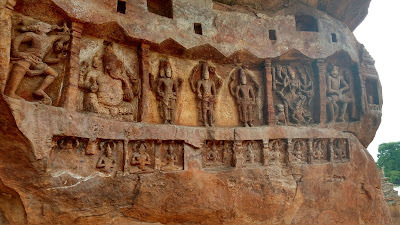 The caves are further classified according to the sect represented - Cave #1 is dedicated majorly to Shiva, Caves #2 and #3 are dedicated to Vishnu while the last Cave #4 is dedicated to the Jain sect. Cave #3 is the largest of all. 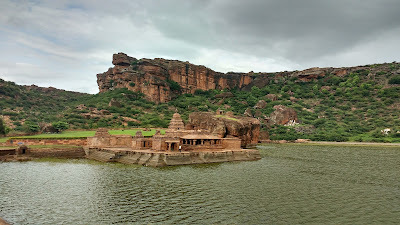 Badami is located off the main highway network of Karnataka. 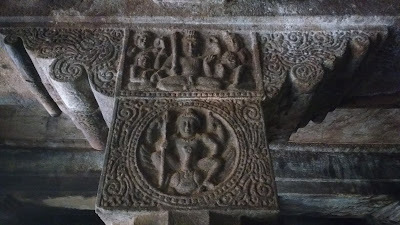 However, considering its importance as a taluka place and a tourist destination, it is well connected to various parts of the state by the NWKRTC. 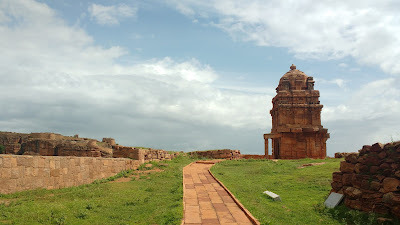 The Hubli-Bijapur highway is accessed by local buses to Kulgeri - a small village about 25km westwards. 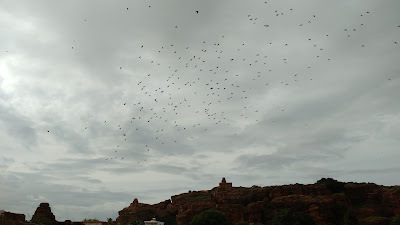 Badami also has a train station connecting to Gadag and Bagalkot, though services are not that frequent. 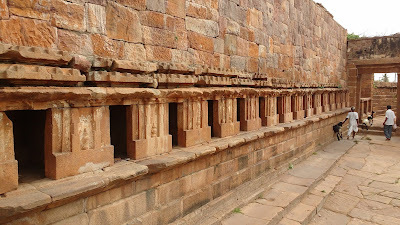 The neighbouring places of Aihole and Pattadakal can be accessed by local buses which run at a frequency of one per hour. Rickshaw / Tumtums are a better option since they provide a flexibility to cover other places like Banashankari and Mahakuta Temples as well. 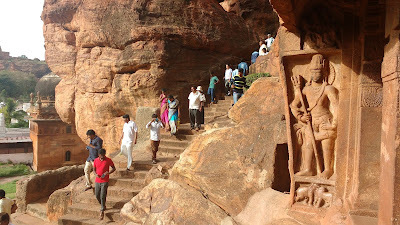 The sites of Badami can be - and should be - accessed on foot. The sites involve ascending stairs on most occasions, so vehicles are mostly relegated to the parking lot. 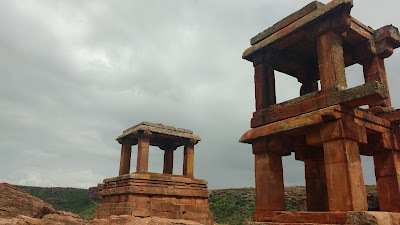 Our day in Badami started in the North: walking from the bus stand to the Archeological museum located at the base of Vatapi hill. Here starts the trek to the monuments on Vatapi hill - collectively called the northern monuments. 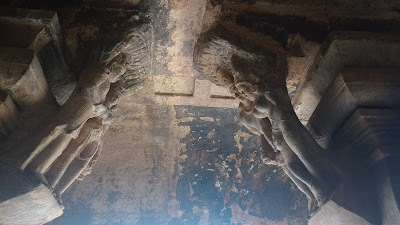 After this, over to the Bhoothnath temple located on the eastern shore of the Agastyateertha lake, followed by an unused track on the southern side to reach the base of the Ilvala hill for the cave temples. 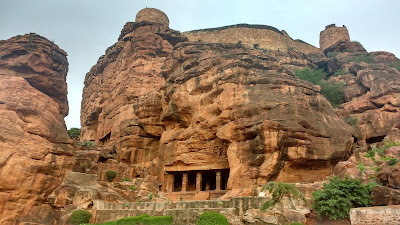 Covering the monuments itself can take about 2-3 hours followed by atleast an hour at the caves. The trek starts at the base near the ASI museum. One ascends a flight of stairs up the hill. 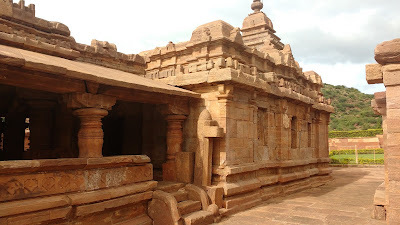 The first point of visit is what is commonly known as Tipu's treasury, accessed through a narrow channel between boulders. 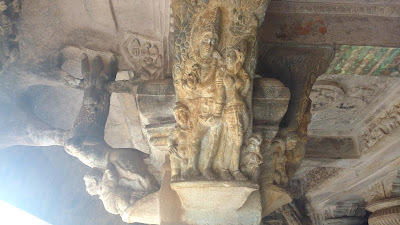 This structure is mostly pillars and slabs in the present state. A side structure is a raised pedestal of sorts. 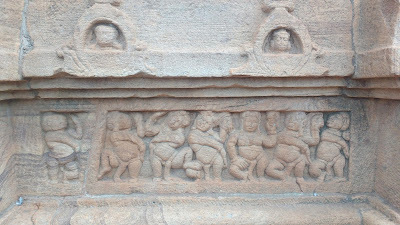 This pedestal has elephants carved into the base probably signifying a seat of prominence. Further ascending through the stairs takes one to the 'Lower Shivalay'. 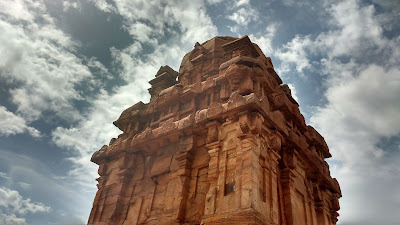 Only the central tower of this temple survives to this day. 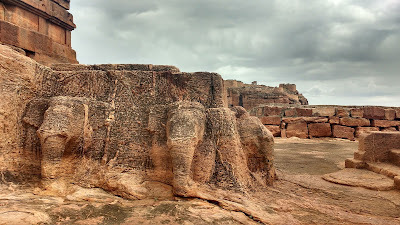 This is considered to be the site of the Vatapi Ganesha - an idol much revered in Kannada literature of that era. 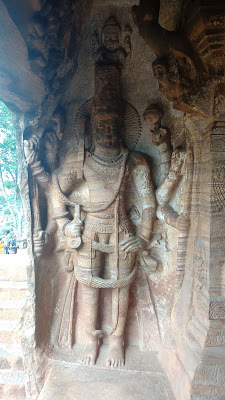 The gate of the monument also features elaborate sculptures. 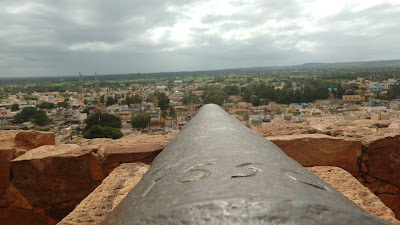 A cannon near the 'Lower Shivalaya' faces the town of Badami is dated to the 16th century. 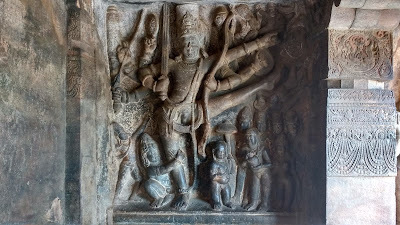 The Lower Shivalay - impressive! 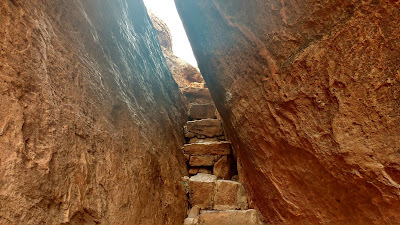 The stairs ascend through the deep gorge to the level of a wide circular bastion of the Badami Fort. 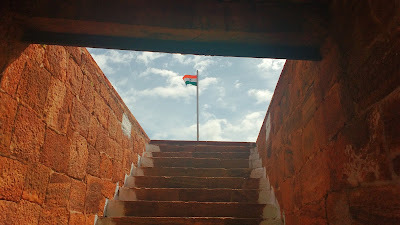 The Indian Flag fluttering proudly from the bastion on Independence Day (the day of our visit) was a sight to behold! To you we look up! 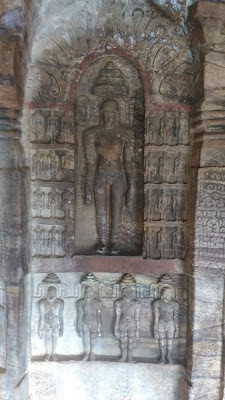 The 'Upper Shivalay' - another brilliant structure is close by. 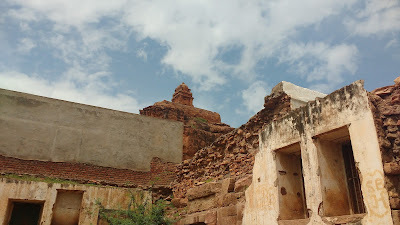 Enroute one sees three conical structures - probably granaries - and a dilapidated, but plastered room. 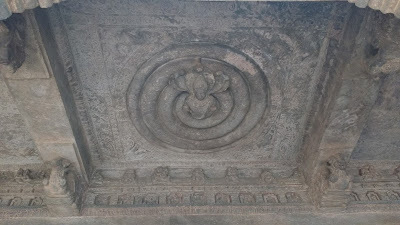 The Upper Shivalay is larger and features some motifs related to Vaishnavism. 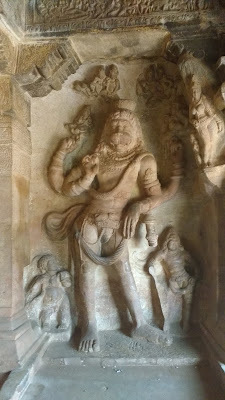 The sculpture of Narsimha is brilliant - and so is the view of the city from there. The 'Upper Shivalay' was the highest point of the trek. The plateau extends further on, but we decided to return from here. 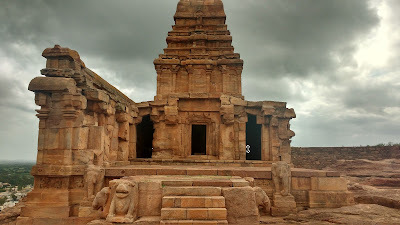 The Bhoothnath Temple is located on the eastern shore of the Agastyateertha Lake. 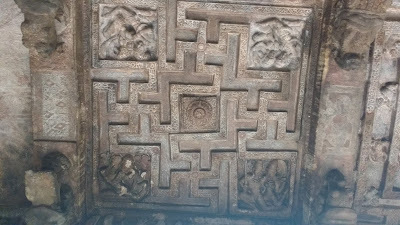 The temple complex is quite simple in design, but very elegant at the same time. The temple directly touches the lake. Sunset golden hour photography would be a pleasure here on a clear day. 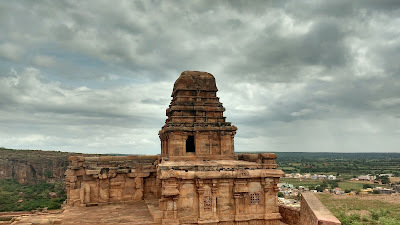 There are some small temples on the way to the Bhoothnath Temple - the Mallikarjuna Temple being notable here. These are located on the northern shore of the lake. 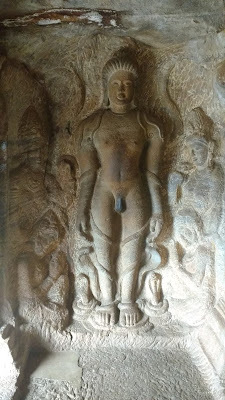 A large boulder east of the Bhoothnath temple has some elegant Vaishnava sculpture. 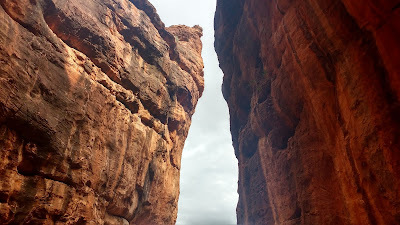 On the other side of the boulder one sees a small cave with a narrow entrance. 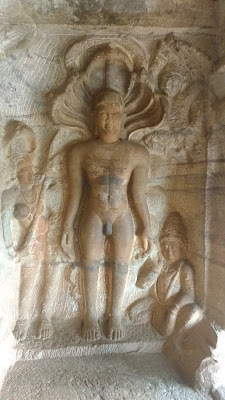 This is a Jain shrine. 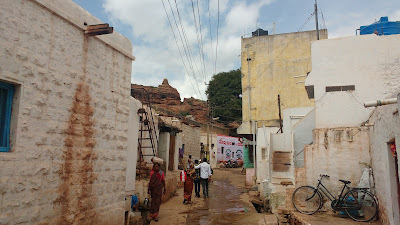 The actual path to the southern cave temples requires one to head back to the ASI museum and then turn south on a small footpath though the village. There's also another way - past a broken fence near the boulder behind the Bhoothnath Temple. 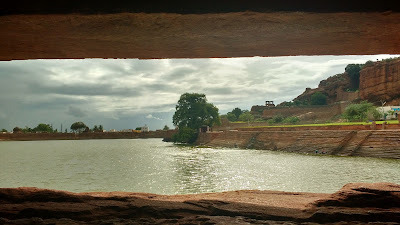 This way passes through a channel amid boulders and then the southern bank of the Agastyateertha lake. 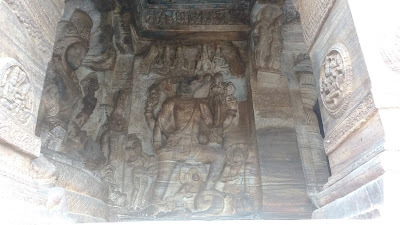 This path takes us directly to the niche temples on the south-western corner of the lake. 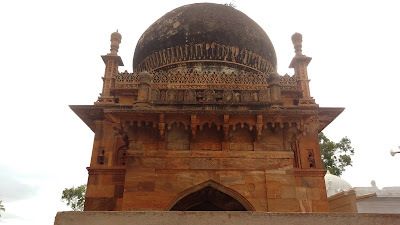 Beyond this is a tomb whose construction is supposedly attributed to the Adilshah of Bijapur. 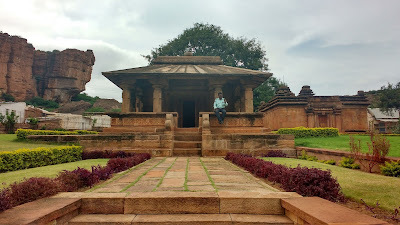 A Datta Temple is also seen midway through the western bank of the lake. Close to the tomb one sees a parking lot. Also a ticket window and a tourist information desk. Voila! 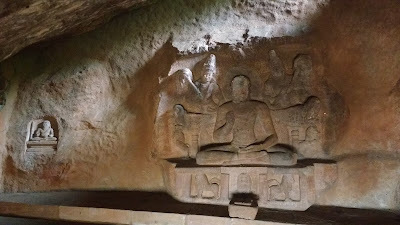 You are at the entrance of the southern cave complex. 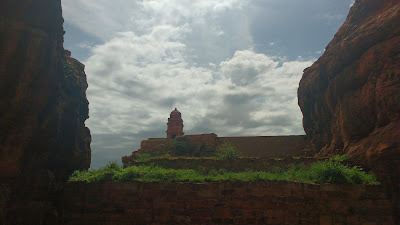 Badami is an exciting place to be for a lover of Indian history and architecture. 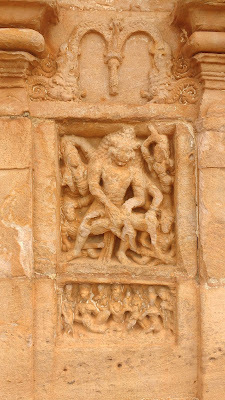 The accomplishments of the Chalukyas are present for the entire world to consume with greedy eyes and perception. 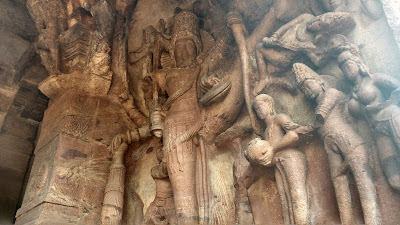 One comes here and justly bows before the masters of the years gone by.